International coffee shop chain Starbucks has announced the launch of packaged tea in grocery stores through its Teavana brand. Starbucks said the launch of the new retail line came on the back of 14% sales growth for its Teavana and Refreshment business at US company-operated Starbucks stores in the 2018 fiscal year to date. Teavana packaged tea will be available from this summer and is set to expand across the USA throughout 2018, Starbucks added. The tea sachet selection is said to be inspired by consumers’ favourite Teavana blends and to results from mixing together full pieces of tea, real fruit and botanicals. The new packaged tea will be available in the flavour varieties Youthberry, Peach Tranquillity, Citrus Lavender, Jade Citrus Mint, Imperial Spiced Chai and Earl Grey Creme. 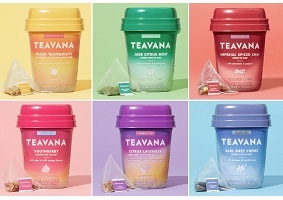 Commenting on the launch, Starbucks group president John Culver said: “The launch of Teavana packaged tea in grocery is just the beginning of the journey to bring consumers some of their Teavana favourites in a new, accessible format where they purchase their groceries. We remain committed to executing our plan to increase our tea business to $3 billion over the next five years through Starbucks global retail, packaged tea, and ready-to-drink premium Teavana Craft Iced Teas”.